Curious what I spend on groceries each month? Maybe the numbers won’t astound you. Maybe you’ll see my budget and say, “Eh. Is that it?” Yes. That’s probably what you’ll say. I’m just sure of it. 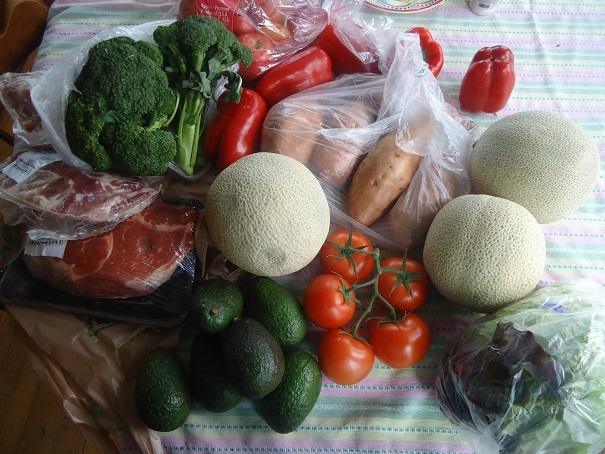 Why am I sharing our grocery budget numbers? Because I’ve been seeing a lot of posts recently shared by women who feed their families for just $37 per week. I’m happy for them, and it’s all well and good that those women are able to feed their families for such a small amount. But you guys? That’s how much it costs to feed my family PER DAY. Well, not quite. Just almost. I exaggerate. Only a tiny bit. I wondered how our budget would change once our oldest went off to college a year and a half ago. Turns out, nothing changed. If anything, it increased (someone please hand me a tissue). I think it’s because our other boys keep getting bigger and eating more. It’s also because, even though Asa lives on campus and eats most of his meals at the cafeteria, we feed extra college kids when Asa brings his friends home (and I love it so much that I would feed the whole campus if he brought them to our table). I buy food from about 7 different sources, so adding it all up and averaging it all out is a bit of a challenge. For instance, we recently bought a half beef and a whole lamb. We’re hoping that will last us an entire year, but I don’t have my hopes up. For the sake of budgeting though, you’ll see when I crunch the numbers below that I’ve divided the total meat amount by 12 months. I go to Lincoln for a doctor appointment about once each month, so while there I hit Aldi and Fresh Thyme Market (my absolute favorite!). We have one local grocery store (not a chain, not great prices) and a Super Walmart that I hit in town each week (except for the week I go to Lincoln). I order online at Amazon. I order from Azure Standard, our health food co-op. I order from Tropical Traditions when they have free shipping mixed with great sales. We get eggs, milk, and beef/lamb from local farmers. This is not about comparing, feeling better than or less than or anything in between. We all have different budgets based on needs, family size, prices where we live, grocery store options, and on it goes. And can I just say that I’m very thankful my boys don’t like drinking milk? I think it keeps us from the poor house that they don’t drink it and we only use one gallon each week for cooking. One more thing (last one, I promise). Our family schools at home and works from home. Therefore all three meals every day for every person in our family (except our oldest son away at college) are eaten at home. If that isn’t enough to make a mama pass out. And no. That doesn’t include our toilet paper. This is why we rarely eat out. This is why we make so many foods from scratch. This is why we rarely go to the movie theater. This is why we drive older, so-so vehicles. This is why we don’t buy many pre-made processed foods. And yes. This is what keeps us healthy. A huge perk —> We have Christian Healthcare Ministries as our health insurance and we pay very little per month. (Read more about that here, because CHM is amazing.) Since our monthly premium is so very low, that helps us afford to pay more for quality groceries (and keep our athletic sons in good shoes – I can’t even). Couponing is no longer worth my time. But I do want to challenge myself in the coming months to see if there are any other ways I can come up with to save a little on our budget. I don’t have my hopes up. I won’t negotiate on quality. But stay tuned. I want to try to document my shopping trips with pictures and receipts to share with you. Interested? 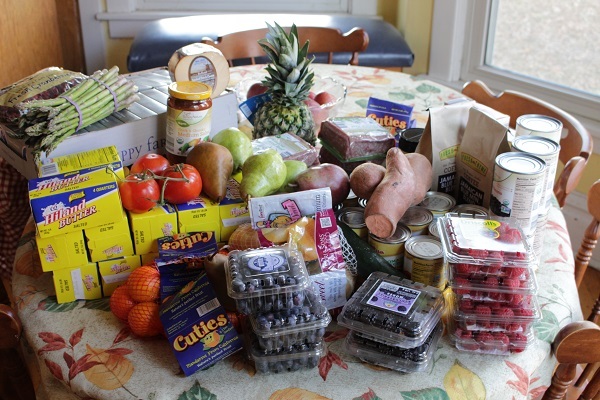 Want to share your grocery budget numbers with us? We promise to keep it fun and encouraging! We’re all friends here. We are a family of six. Me and hubby, 50 & 49 respectively and we have 14 yob, 12 yog, 10 yob, and 7 yog at home. We home school so we have all three meals at home plus a snack each day. Our budget is $900 a month. I order from Amazon, sometimes I use Prime Pantry and sometimes just a straight up order of something I can’t find at my local stores like Bob’s Red Mill organic Oatmeal. I have 2 Walmart stores to choose from, HEB, Kroger and Brookshire Brothers. I make my husbands lunch each day but he buys breakfast. So in addition to our actual groceries we spend probably another $60 a month for his breakfasts. We eat out almost never. We are from Texas. We are a family of seven (soon to be eight) and our monthly grocery budget is about $750 a month. Now, my oldest is 10 and they go down from there to 22 months so our food consumption is not nearly as much as yours, Laura! :) I know that it will increase as time goes on, but I am hoping that as that happens my husband might be making a little bit more (probably not realistic, but one can hope! ), our debt load will decrease (working on that one!!) and also a Walmart just opened about half and hour away from us. I am not a big fan of Walmart in general, but sometimes you have to do what you have to do! Jessica – I live in northern New England too! We have a store in town. It’s pretty small so I can relate to your interest in Walmart opening up aways away. I try really hard not to convenience shop locally because it’s so expensive. And Laura, I wasn’t surprised about your totals. I think you’re probably doing pretty good for six people. I’ll bet if you run a post about the cost of common ingredients or whole foods, a lot of people would chime in about prices. For instance, grocery store milk here ranges from $3.59 (in town) to $1.49 (an hour away). This is something I find super interesting, so thanks for sharing your numbers! That sounds huge, but I sometimes compare my spending to the USDA food plans (that I don’t consider healthy at all…) and I am usually close to the thrifty (their cheapest) plan. You’re not too far off yourself, and you are feeding your family such nutritious food to boot! Love this post. Guess what! I spend a lot on groceries too. I have 4 kids and spend between 200-300 a week. I could do cheaper shopping, but for me, the more times I go in a store, the more I spend. I go once a week to my local grocery store and I do my shopping in 45 -60 minutes. (That includes me talking to everyone ) It’s not always the healthiest or cheapest, but it’s food and it’s done! Sometimes I buy premade food there which makes my bill higher but I don’t care! About every month for work I go to a warehouse club and buy a few things for my family as well. I use up all my stuff and do a lot of planned leftovers. It works for me! We usually get take out once or twice a week. Groceries cost money! We are a family of 7 from southern Ohio! our oldest is 16 and our youngest is 5. I work outside the home two days, my husband works from home a few days and my kids attend public school but we all pack our lunches. 3 of my kids have food allergies and with 7 people who eat a lot, we hardly ever eat out. So that is most every meal at home or packed for 7 people. Every week I hit Aldi and Meijer then every other week I hit Costco. I used to order from Azure standard but they changed the delivery for one of my work days and I am unable to pick it up. I also go to Fresh Market about every other month for meat. I have had to make some compromised on our food but I am okay with that. I too cook and bake from scratch. we spend about $1400 a month also. but that does include any toiletry or paper goods from those stores listed. i try to limit my quick stops for one item. i would love to have it go down some, and i am sure so would my husband! I love when you do grocery posts. It definitely shows how location really effects budget. My family lives in southern California, so groceries are fairly cheap here. Produce is regularly under 50 cents per lb. We follow a strict paleo diet (just meat, eggs, fruits and veggies) so our costs are a little higher for our area. We are a family of 3 soon to be 4. My husband and i are 27 and 24 and our daughter is 2. We spend $400-$500 per month on groceries. We eat all 3 meals at home and our budget does include all toiletries and supplements. We dont eat out. We are in ministry so we do alot of hosting and cooking for others. Very interesting. You know as you do the math for 5 family members and 30 days in a month it comes out to a little over $8.00 per day. In my mind that is pretty good taking into consideration the good food you guys eat. There are 2 of us and we average $400-500 per month on groceries. We do not eat out and everything is homemade. Three meals a day plus a snack and when you calculate by day it is a little over $8.00 per day. You cannot eat out for that price and get “good” food. Thanks for sharing. Yeah, that’s about where we are. 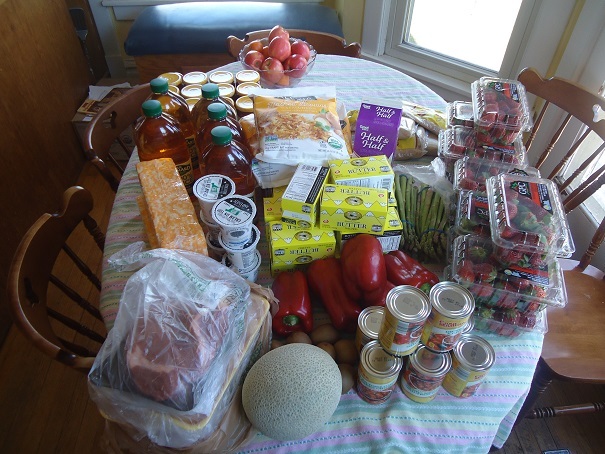 DH was unemployed this summer so I determined to feed our family for under $1,000/month. Feeding a family of 5 (3 homeschooled teen boys, all athletic!) wasn’t easy, but I found ways to make it work. Monday dinner is always beans and rice, with leftovers for lunch the next day. Veggies were anything under $.99/lb. If I didn’t know what to do with it, I bought it anyway and figured it out at home. We do eat organic meat and eggs (bought at the store. Local farms are MUCH more expensive!) When DH was unemployed this summer and I was minding every penny, we ate conventional and could tell the difference within 2 weeks. For us, it is worth the extra expense. No one, and I mean NO ONE could eat anything without checking with Mom first. Yes. I have a plan for that measly cup of leftover shredded chicken thank-you-very-much. Go have an apple. Kathleen – I am the same way all the time, lol. No you may not eat that go have a banana! If you don’t like bananas then you aren’t that hungry ;) I meal plan and buy accordingly so I don’t have a lot of wiggle room (which works for us because otherwise we end wasting food!) but always have bananas or apples if you are really, really hungry and a glass of water doesn’t cut it! Hoho, I had to laugh. Thanks for saying this! My 15-yo daughter is taking on some of the cooking. She is a great cook. She is still learning how to use what we have and to ASK about ingredients first. Last night she ate the bacon. ATE THE BACON! The rest of us cried. Not really, but we all love bacon and I only buy it once a month. Thank you for sharing this! That is about what we spend on our grocery budget per month too. (And we are like you – we rarely eat out, drive old cars, etc.) I am hoping to reduce our monthly grocery budget a bit by having a huge garden this year and preserving much of the harvest. I see those posts on Pinterest with bloggers bragging that they only spend $50 a week on food and have to wonder what sort of processed foods they are feeding their families to get the total that low (and at what cost to their health). I know that smart couponing can be part of a low budget like that but it would still have to be a ton of processed foods because I rarely see coupons for whole foods. I love this! We don’t go to movies and such. We cook lots at home. When my now adult and graduated college kids come home, my budget really takes a hit, but I love it when they want to come home and want what mama cooks. :) Thanks for your honest sharing. In Indiana, our budget for 3 kids under 11 and two adults is probably around $800. I have to be gluten free, trying to stay paleo, and we make simple meals like you do. My husband skips 1 meal a day because he wants to keep losing weight (don’t ask). We don’t do beans, or meatless meals. We shop mostly at Aldi’s and sometimes Meijer, and rarely use coupons because there are not many coupons for the stuff we buy like fresh produce and meat. We currently do not have a deep freezer, but I would love to buy a side of pig or something. I agree, quality is definitely important. I don’t buy organic on purpose, but sometimes, the gluten free version of something is organic. We don’t consume a lot of milk, but we do eat lots of real cheese, from the store, but not the processed stuff. I love it when you share your grocery budget and what you buy. It makes me feel like I’m on the right path by just throwing some chopped raw veggies at the kids with some pork steak or chicken and call it dinner. Thanks for sharing! I have a family of four (two pre-K aged kids) and I spend about $600/month. I also put a premium on fresh produce, a wide variety of meats and whole grains. And I believe strongly in having a 3-month supply of food in my pantry for emergencies so some of my grocery budget is just for stockpiling. We do eat out once a week but that’s factored into our entertainment budget. I live semi-rural with many choices in grocers, health food stores, farmers markets, and discount stores and I am grateful! I also use Amazon Subscribe and Save and use your links to Tropical Traditions deals (thankyouverymuch). I believe it’s much better to pay the grocer and the farmer than the doctor so I’m perfectly willing to sacrifice in other areas in order to have enough funds for quality food. Very interested!! I’m working on changing my family’s diet to whole, real food. Unfortunately, I don’t have many options where I live, but we are making progress and feeling better because of it! We spend about what you spend for a family of four and we do not entertain. I think your budget is fantastic considering all the people you feed. I do buy some organic and I shop at Costco once a month and some of our food comes from Amazon. Our grocery costs seem to be higher than yours. We live in the NE. You should get the Ibotta app it can get you some money back on the things you are already buying(including that toilet paper) and the Walmart Savings Catcher. It just takes a few minutes while you’re putting up your groceries. I only spend about $400 a month on groceries for my family of 3, but I have gotten back about $100/year from Ibotta alone. Thanks for sharing, Laura! We are a family of 8 in PA ~ hubby and I and 6 children (22, 19, 17, 15, 13 and 10). We homeschool and hubby & older kiddos pack lunches. I was recently working on our 2017 budget and looked back over the 2016 grocery costs (food, paper goods & toiletries). I was astounded to find it was around $1400 a month. My husband graciously pointed out that was only about $5 a day for each of us … not bad at all for healthy food & snacks! Our family went Paleo a couple of years ago. Our grocery budget went up $4,000 that year! I knew it would be more, but I was shocked. Although we lost a significant amount of weight, my husband got kidney stones. We are doing a modified veggies & protein diet with lots of water. We spend about $1200 a month for the 4 of us. I cook a lot from home, but nothing like what you do. We eat some organic, but not totally. I have stopped shopping at Azure Standard because the quality of the produce is inconsistent. This year my goal is to coupon the “drug store” goods to reduce my spending. Thank you for being bold and sharing! This is helpful and interesting. Thanks for your food budget info Laura! It’s so much fun to read your posts in my inbox. You are doing a wonderful work! …Budget weekly: $175.00 (excluding our own beef and eggs), into an envelope system. Includes feeding a elderly member. Hubby buys meat when it’s super-special. When there are case-lot sales hubby buys extra. Winter we’re limited (or should I say blessed )to banana/apple/orange/occasional kiwi and grapes because the price is so high. Splurge on mini-tomato and mini-carrots. Water, tea, milk. One afternoon coffee (prepped in my big cup). Buy products according to price/unit. I receive points for a wide variety of products I always buy and will use them for “free” groceries. I price check the stores in this area but I end up at the same store because it often has the “best” price. Oh to have better prices on fresh food and nuts!!!! Garden and can/freeze vegetables, fruit in summer from fruit trucks (hubby will buy a lot with his budget). Pick wild berries for sauces/canning/jams. Biggest expense is lids that hubby helps pay for. Home baked bread (grind our own wheat and flax) and baking. Cheap frozen pizza when I haven’t make homemade. $5.00 + tax for a meal out/week budget in trip to city per person. Store snack is chips one/two times a week. I thdon’t no we all from no it interesting to peak into someone else’s budgeting world, specifically concerning food. We are in central New Hampshire with two small grocery store within ten minutes and a bazillion thirty-forty minutes away. In the warmer months (May-October) we have a garden and regular access to local produce. With some effort we find local goods year round and we freeze and preserve a great deal from our garden. My family is four, hubs is 39 with MS but very active so eats like a 20 year old, I am 34 and a part time fitness instructor, daughter is 5.5 and son is 3 but the size of th 5 year old and EATS! Our spending really ranges throughout the year. For the last two months of 2016 I spent about $700/month. Some months it’s less but often it’s more. We don’t eat out due my sons food allergies (tree nuts and shellfish) so lots of cooking at home. Hubs takes lunch most days too. About twice per month I share a meal with my great aunt and I frequently share with my parents. As others have mentioned, we view a good diet as our healthcare. We have terrible health insurance as we are self employed so it’s really only catestropic. Thanks for sharing… perhaps a regular addition to your already fabulous posts?? Love this post! Thanks so much. 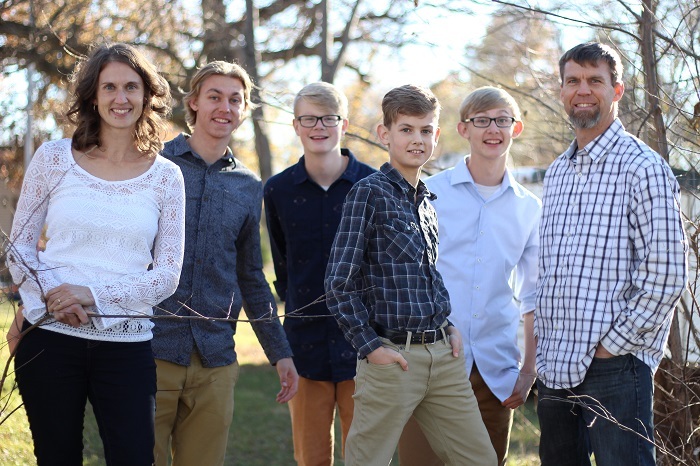 We are a homeschooling family of 5. Our kids are 8yob, 5yog and 1yog. We spend around $150 a week at the grocery store on whole foods. We eat all our meals at home and my hubby takes leftovers for lunch. We live in Virginia Beach, VA. I am hoping Azure will come this way soon!! Thank-you for this very interesting, informative and eye-opening post about the details of your grocery budget. I have to admit I’ve been sitting here astounded and just thinking no wonder I have so much trouble trying to stick to our (much lower) proposed grocery budget! We live in the Boston, MA area (not too close to the city), so I think that groceries are not cheap around here. I also admit that I have been struggling some in the busyness to keep track consistently last year. That is something we aim to work on for 2017. We are a family of four, consisting of myself and three tall/large men. It became a bit more realistic when I took a third off of your figures for comparison since you are feeding six large or adult people. So maybe I’m not so far off. I think reading everyone’s comments above, too, will definitely help us fine tune our grocery budget for the future. I also shop at a variety of stores in our area (that’s a blessing), from two local markets; one that offers some good store coupons to couple with good sales (we also earn gas points for what we spend, so that helps), the other has some of the cheapest prices in the area, we are club members at a warehouse-style store and buy a lot of our food and supplies there, and I buy from Amazon and use their Subscribe and Save almost monthly. Oh, yes! And we participate in the CSA program at a local farm (plus last summer I worked there, which provided extra benefits), for much of our warm-weather produce. I am blessed that we have so many options available. Thank you so much for sharing this info. It is helpful and encouraging. I would love it if you’d let us know what you (or others) purchase through Azure standard. I know you had a post on that once, but it’s been years. I have kind of a difficult time looking through their online catalog and don’t think I utilize them well. This post as well as the ones where you tell us what you are “economizing” on are so incredibly helpful. As money gets tighter and prices get higher, I am always wondering what organic products I should continue to pay for, and what I should just give in and purchase non-organic. A new post on that would be wonderful too. Organic cheese….or just “natural” WalMart version, etc. Any thoughts from you or others? My husband is back in school and working full time while I am home with the kids home schooling and such. My youngest is too young to go to school full time even if I do not home school. Our income is very low. I can’t imagine having that kind of budget. Not because I don’t care about my family’s health, but because we don’t have more money. I am trying to find ways to make money from home, but, so far, I haven’t been too successful. How blessed you are to have this blog. Since it come up in the search as one of the first things and you had had it so long, I bet it pays for your grocery bill! As for me, I do what I can with what I have. Sometimes I HAVE to compromise on quality because we can’t afford it. But I have been able to get a lot of deals at Dillons with coupons and mark downs. That helps. You are also SUPER lucky to have farmers willing to give you healthy stuff so cheap. I live in the breadbasket, but most places aren’t organic or healthy. The ones that are charge a huge amount. It is depressing. Sometimes I can get mark downs on healthier grass fed beef and then I stock up. Hopefully when my husband is done with his degree, he will make more and we will be able to feed our boys better. But, since his degree will be in the environmental field, hopefully there will still be jobs left in that field considering the new administration. Pray there will be! Because my two boys already eat A LOT and I am worried about their teen years. Sounds like eventually you’ll have a bigger budget for groceries and in the meantime, you are doing great with what you have!! God will provide for your boys’ teen years. When our boys were little I couldn’t have imagined how many groceries we’d need to buy or that we’d ever be able to afford them. But He always provides, and I’m thankful! I have been in your shoes and can empathize with you. Please, don’t beat yourself up about the things you can’t purchase right now. I learned where the clearance items were in the two stores I shop at and head there first. I sometimes use coupons on the clearance items to make them close to free. Clearance meats freeze just fine for another day if you can luck up on a sale. Sometimes, getting the good stuff inexpensively just requires some creativity. And, if you can’t buy organic or non-GMO products right now and you have to buy a dented can of something to fill their bellies, it’s okay. Keep your chin up and know that God is looking out for you and your family! Our budget for a family of 6 ranges between $300-$400 including state sales tax of 9% because we are trying to pay off school loans. I don’t say that to brag, only to encourage you that you are not alone, and I’m sure you are doing the best with what you have. We are a family of 5, that includes 3 boys ages 14, 12, & 10. We live in the Midwest with numerous stores available, including Aldi, Costco, and Walmart. Last year we averaged $960/month. That is just food, not when we eat out or when the kids eat school lunch and no TP either. :) I thought it was ridiculous and have been trying to shop smarter this month. I’ve already spent over $700, and we still have a week and a half to go. Sigh. I think with the amount of people you feed and the amount of healthy food you serve, you are doing fantastic! I recommend trying Ibotta. I don’t usually sign up for the rebate things but this one works and is easy. Lots of rebates you will never use. But often they have rebates on “any brand” milk, bread, tomatoes, squash, onions. It does depend on the store you use but the walmart ones count for sure. No huge $50 savings but a few cents at a time can add up. I also get rebates on diapers and trash bags so there may be some non food rebates you could use as well. I have six kids – five boys – so I consider your food posts good warning. My oldest is 15 (girl) and boys from 13 to 1. So I know the food requirements will increase exponentially! Thank you so much for sharing this! I have two teenage boys (16 & 14) plus my husband (who still eats like a teenager) and myself, and I get so discouraged seeing these $50/week posts because there is no way I could keep these guys fed on that amount. I am so encouraged to see that you understand this! And also encouraged that I’m not alone, and that feeding teenage boys really IS expensive—it’s not just me spending too much. God Bless You!!! I did the math and you spend about $50 per week per person. We are in a similar spending situation with 3 at home, 2 in college, and 1 recently married. Whether we have 5 or 9 (our daughter in law spent a lot of time here while they were dating) I spend $50 for each and eat healthy. It breaks down to $2.38 per meal per person which is really good compared to the price of convenience foods and restaurants! The only scary part is having a food bill that is larger than our mortgage. :) However, I wouldn’t trade having our beautiful, healthy kids for anything! We have 7 in our house. Me, my husband, 14 yr old girl, boys ages 6, 3 and 1, and our 24 yr old son (doesn’t eat much at home so doesn’t really count). I try to keep my budget around $800 but I usually spend close to $1000. I shop weekly at Aldi and we go to Costco. Here and there I might need something some target or food lion. We eat a lot of fresh fruits and vegetables but Aldi has great prices for that. We are exploring the idea of buying a half of beef. It’s a lot up front but I think we will save in the long run. I think you forgot a bulleted point. Geographic location matters A LOT when talking about grocery prices. We live in the Seattle area and food is VERY expensive. I’ve accepted that feeding good food and feeding other people is something we’re committed to and I’m grateful for the blessings God has given us. There are a lot of things I won’t pay for, but food isn’t one of them. Good shoes are also a plus. Nordstrom is my favorite for shoes due to their prices and also great backing of their products if a shoe wears out before it is outgrown. This has actually SAVED me a lot of money in replacing shoes as well as giving my boys much needed quality. When they were little I bought used shoes, which were fine, but now pretty much always new ones. We buy grassfed beef and raise our own pastured pork so about $4000 a year for that + $750 a month for other food per month (Amazon, Costco, Fred Meyer, Haggen). Mostly Produce with some Larabaras as a “treat” and occasionally grain free flours/nut milks (yes I know I can make my own). I have three very active boys aged 8, 6, and 5. We eat grain free, dairy free, and egg free. We do not eat out, go to movies, etc. We also rarely by “convience” foods like dairy free cheese, yogurt, cereal. My boys eat rice, beans, and occationally rice pasta. My husband is allergic to all those things. I’d love to see the breakdown of what your produce and other food costs are, etc. Hi! We have a family of 13 and I shop at Azure Standard, local farmers, Frankferd Farms, Vitacost, and our local Sams Club and Kroger. Our food is based on organic, grass-fed traditional diet. I pretty much make everything from scratch. Our milk is $10/gallon at 40 gallons a month. It is delivered to our door every Friday. I buy most of our fresh fruit/produce/grains/etc. from Azure Standard at around $800/month. However, I just restocked on a lot of the things for the year and that was $2500 from Azure alone. I do Family Wilderness every 3-4 months for our oils and I’m on the Buyer’s Club to save a lot of money through them. I usually buy 5 gallons olive oil, 5 gallons of the expeller pressed, and 5 gallons of the centrifuge. That usually costs $700 every 3-4 months. I also buy 5 gallons of raw honey from a local honey farmer for about $200 every 3-4 months. My eggs come from my milk supplier but lately I have had to purchase them from Azure because of the cold weather and they aren’t laying as much. We go through 40 dozen a month at about $4.50/dozen. I also buy whole beef, whole pork, and whole chickens from local farmers and it is $4.50/lb. beef, $3.99/lb. chickens, and $3.00/lb. pork. Last year we bought a 700 lb. beef and that lasted us about 9 months so this year it will be 2 steers at approximately 600 lbs. We spend about $300/month on chickens with about 20 whole chickens/mo. and we aren’t big pork eaters so it lasts us about 6 months. I figure we spend about $8000-9000/yr on meat alone. OUCH!!! At Vitacost I will buy our vitamin d and maybe some tea. I forgot about my membership with Frontier and I get all of my herbs, spices, teas, etc. from them every three months and usually spend about $150. I just buy toilet paper, freezer bags, and some organics at Sams. I spend about $25-50 monthly there. Kroger is for bananas and noodles (pasta). Monthly budget is about $2500. We do help that out a bit with tax refund and the whole beef. I’m very frugal, make everything from scratch, and try to use every bit of what we buy. I will make candles from our animal fats, broths and stocks from the bones, dog food and liver pills with organs. I make all of our own probiotics by making milk kefir, kombucha, water kefir, etc. I felt bad about what we spend but I also know that we use our food for nutrition and never need the doctor. We also have a son that is allergic to soy, pb, peas, and can’t have store bought milk. We have healed a lot of his allergens through building his gut back. I also have 3 teenagers and a hungry husband. I’m usually pregnant every year and I’ve been continuously breastfeeding for 9 years now. I have a 16, 15, 14, 8, 7, 6, 5, 4, 2, 1, and a 3 month old. I hate to see what our grocery budget will be once I have the 8 year old as a 18 year old following all the others!!!!! We need a farm. You made a good point about not comparing what you spend to what others spend – where you live, prices in your area and the individual needs of your family all play a part. We live in New Hampshire and I’ve noticed prices on food are much higher here than they were in Florida (we moved back north just after my son was born). All that to say, thank you for your inspiration! You feed your family well, but do it as frugally as possible. Bravo! Our budget is $600 per month for a family of 7, but my kids are a 10 year old boy, 8 year old girl, and then 3 boys that are 5, 3 and 1. You gave me a glimpse into my grocery future! One advantage we have is that my husband and his family are huge hunters, so we always have venison and usually a few wild turkeys. Between my in-laws fruit trees and our garden, we also get quite a bit of produce during the summer and try to can it if we can. This makes me feel better. We have a family of 6. My kids are 18, 14, 9, and 14 months. They are all athletic, except for the baby :) We spend between $1000 and $1200 a month. I have tried to do less, but just can’t. Thank you so much for this!! I cannot tell you the number of times I’ve read the “feed your family for pennies a day!” articles and walked away feeling completely defeated. One of my children has anaphylactic food allergies to almost all of the 8 major food allergens and corn as well. All four of my children are gluten free. I have autoimmune issues that require a grain free, paleo style diet. Two of my kids are teens, and we also homeschool! So needless to say, our grocery bill isn’t low at all!! We spend about $50 a day as well. It is a huge relief to hear that a bare bones grocery bill isn’t practical for every family in every circumstance! Thank you so much for posting this. It is refreshing to hear that low food budget are not for everyone. I have 17yob, 15yob 13yog and 12yob and they athletes always hunger. I spend anywhere from $700 to $1000 on the food budget. I am school teacher my 17 and 15 yob attend school I teach at so pack them lunch and dinner because they are into many activities after school. Also pack dinner for younger two they are in drill team. Thank you for sharing this! We are a family of six, but our oldest moved a state away last month. She often had one or two friends over for sleepovers, and one friend who stayed with us for two weeks. Our budget fluctuates from month to month ranging from $1100 up to $1400 per month for groceries including household and personal hygiene items. Unfortunately we do not have a yard suitable for a garden, but we did find a local farm that sells fruits and vegetables in the summer of limited variety for a dollar per pound. We are also considering getting a deep freezer and half a cow in the spring. It’s nice to read a post with a realistic budget. Thank you for sharing that!!! I have three teenagers, all three in sports, and keeping them fed takes some money. I’ve tried meal planning and getting the costs down, but they get hungry. So it’s nice to hear I’m not alone. Our budget for food is $1500 a month and this includes toiletries and pet food/supplies. I shop at Aldi, Walmart, Kroger, Whole Foods, and Amazon subscribe/save. My dh shops at Trader Joes. We do not drink regular milk at all. We do buy whipped cream and heavy whipping cream for cooking and coffee. 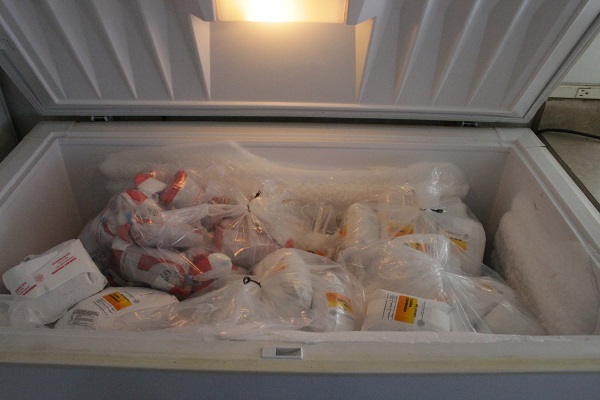 I would love to do half cow for 6 months however we have no freezer space. We have two fridges as we buy produce each week. We are LCHF/Keto family so we buy a lot of meat and veggies fresh. We do not garden. We have the space for it but no time for it. Both dh and I work full time plus we homeschool our kids. Like you, we do not go to movies (only once a year for the special movie we want to see in the theater) or eat out but only for special occasions like birthday and anniversaries. We drive older used vehicles. We use timeshare for vacations (thanks to my parents). My dh says its impossible to feed our family for $50 a week because of the way we eat. He doesn’t want us to sacrifice quality of meat so our food bill is higher than most. When I tell people how much our food bill is they faint. This article is a fresh breath of air!!! Thank you! We are a family of 5, 3 of our family members are teenage boys. Our boys are in sports and after school activities. Our boys bring their lunches to school. We don’t eat fast food or eat out often. We don’t drink cows milk or eat gluten due to allergies. I cook ALOT from scratch. Our monthly grocery bill averages $1400 a month. This doesn’t include paper products or toiletries. I budget around $125 a month in that category. This includes contact solution, shampoos, deodorant, toothpaste or other personal essentials. My husband and I are in our 70’s, retired and raising our 15 yr old grandson with no other help but a $117/mo TANF for him and $225/mo for food…. We live in a Chicago, IL suburb.. It takes every penny of our social security to pay our rent (the cheapest around here), car & insurance payment, electric and gas, life insurance, laundry and personal hygiene expenses.. We buy 2nd hand furniture and clothes when needed,… I don’t where else we can cut expenses.. I love food budget posts! Thank you. I always feel pressured to spend less on groceries, but this helps me see that I’m actually doing pretty well with my budget. I live in southeast GA, and I think we have a pretty low cost of living compared to many places in the country, and I’m thankful! I budget $125 per week for 5 people: DH, me, boy (11), boy (9), girl (7). Even though they’re not teenagers yet, my boys can put away the food! And then tell me they’re hungry an hour later! I do my best to stretch my food budget using coupons and great sales at Kroger (lots of good deals there). Still don’t have Aldi or Azure here – wish we would get them. Thanks for the encouragement! Wow- Thanks for the heads up! I have 4 boys ages 7-15 months, so this is what my future holds! I am so glad you shared this, because I have been struggling with my numbers a bit. I use to coupon and be ridiculously tight, but I agree with you and have gotten to the point, both in our budget and conviction, that eating healthy food is more important than spending as little as possible. That being said, we do try to be good stewards of our money. The last few months we have spent around $700 per month in groceries (this includes toiletries and household supplies like paper towels and cleaning) on our family of 6. I have one son in 1st grade, but he takes a lunch from home all but one day a week. My kids are young and do not eat very much, so I feel like that number is pretty high! We are focusing the next few months on 1. Menu planning with more intention. 2. Going to the store less often. 3. attempting to buy fewer snack foods and replace them with homemade options. I am hoping to go down a bit for now, but we know our grocery budget in the future will be much higher! We are a family of 3, with a MUCH smaller grocery budget, but your number did not shock me too badly! Great job feeding your family (& kudos for WANTING to feed extra teens – that’s so important!) I recently increased my grocery budget to be able to incorporate more produce. It’s worth it! We are a family of 5 from southern Ontario Canada.we have a 12 yog, 7 yob and a 5 yob.i make everything from scratch with fresh products.we spend $500 per month on groceries and $80 on meat at Costco every 8-10 weeks. Oh my goodness finally someone speaking my life and numbers. I know it shouldn’t be a comparison game but I have been feeling really down with our grocery spending. I know I could make a few tweaks but ours is very similar maybe even a little higher but we also live in NH and it’s just expensive here. I have twin 17 year old boys and a 13 year old daughter and we have at least 2-3 of their friends daily. Thank you for this!! This post is refreshing. 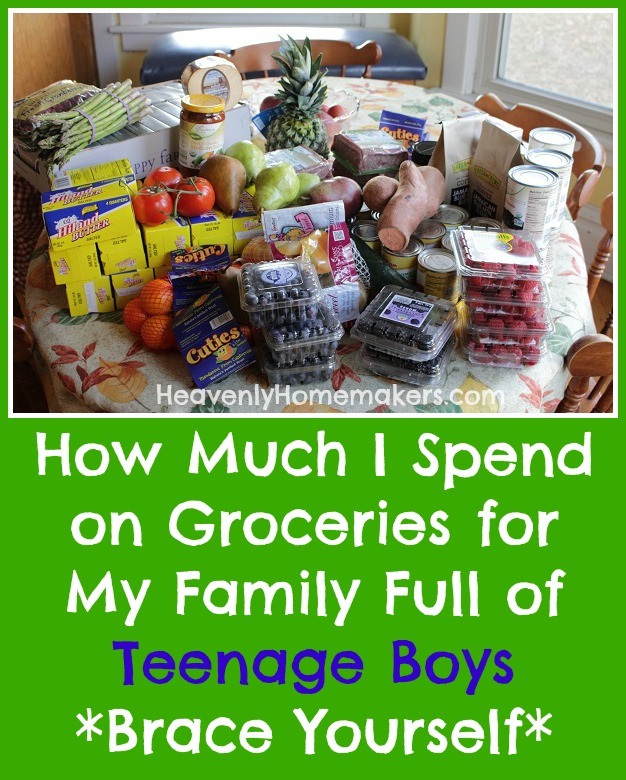 I don’t have teenage boys to feed, but I try to feed my family whole, nourishing food, and certainly do not relate to the minimalist food budgets I’ve seen. We are a family of 4 with a preschooler and 11 month old. The baby doesn’t eat a whole lot, but I breastfeed and I’m hungry all the time, so I eat a lot more than average 29 yo. My daughter and I have food sensitivities to egg, dairy, gluten, and oats, and she is sensitive to almonds and cashews. I make the same food for everyone except I do give my husband eggs in his lunch. I cook almost everything from scratch and we almost never eat out. We’ve been spending about $140/week (600/month) (including paper products), although if finances weren’t so tight I could easily spend more. I buy everything I can from Aldi, but also occasionally go to Earthfare, Trader Joe’s, or the farmer’s market. I buy a few things organic- tomato products, apples, celery, lettuce, an de grassfed ground beef when i can find on sale ($4/lb). I know this post is not new, but I found it quite confirming along with the confirming post. We are 51, 53, we are cyclist 3 plus times per week, with weight lifting other days. Our dds are in college. We together spend about $1200/mo for groceries/dining out. Some (not all) of our toiletries are most likely included. We also feed way more than just our family ( a blessing) . We like milk especially since we found A2 milk (lactose milk didn’t work but this did) …so we spend a lot on milk . – My girls swam competitively in HS (the cost of swimming is club fee+ entry fees+ food cost) But I know another mom who has record sitting fast boys who could feed her family on a pound of meet for dinner in a sauce or casserole. Her babies literally came out of the womb with muscles. Mine on the other hand needed lots of protein to keep muscle. I can’t find my records during their HSchool time but it was in Albuquerque where we had Costco and TJ close by plus NO FOOD TAX. – We moved to Norman OK. We do have sprouts and Aldis and Walmart and a local that has some good prices. But no Costco : ( and we do have FOOD TAX. I went to OKC and stocked up at TJ (not produce) and was shocked by the $40 tax!!!!! So locality matters. Food here is more expensive, at least the foods we like, plus tax! Now that our girls are off to college. dd #1 dropped sports after her fresh yr, she is so small now. I had no idea how much was muscle. She is super frugal and stated she probably doesn’t eat enough meat. Her groc store bills are $35 – 60 /wk. She found a college christian ministry that treats students to lots of meals with families so she eats “out” at least 4 meals per week. So overall if they go off to college it isn’t super cost effective. Basically you are stocking 3 fridges instead of all sharing. I am afraid they probably have waste that would make me crazy if I saw it. Like not eating all the hummus before you get tired of it/it expires. Hi, I have a family of 3 teenage boys, they are 12, 14, 16. Our food budget is $900 per month. We eat out like never, occasionally we get pizza from Papa Murphy’s. I feel like I am frugal with the dinners, but snacks are really what kills me. Have any of you found any inexpensive snacks that fill teenage boy stomachs?! Literally they go through a family size wheat thins or triscuits in 1 day! Produce seems more expensive. I do have Costco and Walmart close by. Thank you for this! I have 6 boys, ages 12, 10 8, 6, 4 and 16 months and I’m already having a hard time. This gives me a good idea of what to anticipate! Finally! A realistic grocery bill! I am a single mom with one teenage son . He constantly eats! And , like you, I feed him quality food. All our meat and most of our fresh fruit and fresh veggies are organic. He is rarely sick. I attribute that to our healthy meals and his exercise through sports. He is an athlete year round, so not overweight. I have read many articles about low grocery bills, but they are usually families with toddlers who are eating only 3 small meals a day. My son eats 6 times a day! I feel better about my large grocery bill choices . Thank you for your article! Good luck to all your boys!